Andrew Jackson was the 7th President of the United States of America, the symbolic leader of the country. His presidency began in 1829 and ended in 1837. He was 61 years old when he first began his term of office on March 4, 1829. He was named after his father, who sadly died just before he was born. He had a variety of nicknames such as King Mob, The Hero of New Orleans and Old Hickory. His nicknames reflected his popular, military successes during the War of 1812, aka the "second war of independence." In the Battle of New Orleans (January 8, 1815) Major General Andrew Jackson defeated the invading British Army. His troops affectionately referred to him as being as "tough as old hickory." The picture of Andrew Jackson portrays an interesting image of what this famous man looked like. The picture shows the clothing and the hairstyle that was fashionable during his presidency. He is described as having a gaunt, slim appearance being 6 feet 1 inch in height and weighed 140 pounds. He had sandy colored hair, that turned gray as he aged, and featured a pointed 'widow's peak' at his forehead. His long, pale pointed face was dominated by his blue piercing eyes. He ensured he wore the clothes that were appropriate for the occasion and the people he was associating with. Character and Personality Traits: What was Andrew Jackson like? 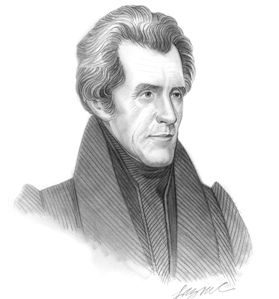 The personality of Andrew Jackson is described as a good friend and a bad enemy. He had great charisma, charm and excellent leadership skills. He had the ability to change his demeanour according to the people he was mixing with. He was quick to anger but able to control his temper quickly. He was an open, frank and direct man. The important role and duties of the President of the United States of America include those of Chief of State, Chief Diplomat, Chief Executive, Commander in Chief, Legislative Leader and Leader of his own political party. What was Andrew Jackson famous for? Why was Andrew Jackson important? The history and life of President Andrew Jackson during his presidency is conveyed in the following fact file in an easy question and answer format. What President was Andrew Jackson? He was the 7th President of the United States of America. The dates of his presidency began in 1829 and ended in 1837 (March 4, 1829 to March 3, 1837). What other political offices did Andrew Jackson hold before his presidency? What was Andrew Jackson' nickname? Who was Andrew Jackson' s first lady? Andrew Jackson was famous for the events and accomplishments of his presidency, but what are the facts about the man and his private life. Facts and information about the private life of Andrew Jackson can be found in the following fact file in an easy question and answer format. When and where was Andrew Jackson born? Where was Andrew Jackson educated and what was his religion? What did Andrew Jackson do before he became President of the United States? Who was Andrew Jackson' wife and when did they marry? Did they have kids? We hope that the picture, facts and information on President Andrew Jackson will prove helpful to kids, school children and schools learning about the presidency of this famous American leader. The facts about Andrew Jackson provides an overview of the President's character and personality traits. Watch the video and learn more about the major events of his life and his accomplishments. The following Andrew Jackson video is a useful educational resource for kids, children and schools learning about the life of the US President Andrew Jackson.